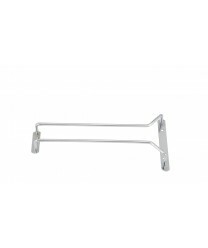 Attach the Winco GHC-10 Chrome Plated Wire Glass Hanger, 10'' to the underside of a shelf or cabinet, and gain valuable storage space for fragile stemware. With the help of these wire glass hangers, you can keep your glasses clean and protect them from breakage. FDick 8136FDick 813 Narrow Blade Boning Knife 5"